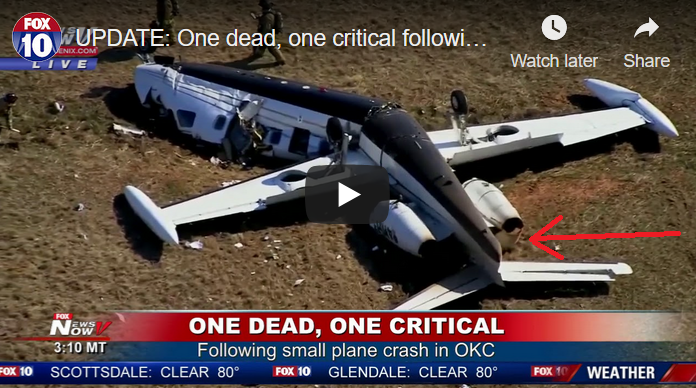 Two people have died following a small plane crash at Sundance Airport in OKC. "A twin-engine Westwind jet crashed about 3:40 p.m. Monday at the Sundance Airpark. Oklahoma City Fire officials confirm a male and female were onboard and both have died. The FAA says the aircraft departed from an airport in Panama City, Florida and crashed while landing at Sundance." Looks like it was the airport FBO's aircraft. Any theories as to what happened? Let's not waste time here, lives are at stake. Any theories as to what happened? I knew both pilots. Solid sticks both. I don’t have a METAR but it was clear & a million with very light winds. This was the home base for both pilots and this aircraft. Doug posted on FB about two weeks ago indicating he was undergoing Westwind simulator training or recurrency. He flew Westwinds a lot, and flew a T-28 over the weekend. Finally has been here - sorry to hear. This may have happened on impact but it does look suspicious. I noticed the same thing - the left reverser deployed but apparently not the right. Witnesses said that the plane was hit by a gust of wind as it touched down, which flipped the nose into the air and flipped. My question: Would an asymmetrical reverser deployment cause a pitch & roll, or simply a yaw? Also, can the reversers be deployed separately, or is it a single lever for both? This accident, or various ways to get your airplane upside down, on fire, along the side of a runway and how to avoid that should not be discussed until the NTSB releases it’s final report. Because that's never been done here before? Because it isn't helpful for other pilots trying to understand this accident? Because it isn't instructive for other pilots flying similar aircraft? I believe gne was shooting for sarcasm there. He originally had critical injuries. And the pilot who was initially reported as injured and transported was the female. I’m not sure an asymmetrical TR deployment would be enough to cause this. On the last business jet I flew when we had a TR deploy in the sim it wasn’t that huge of a deal, even at high speed and power settings. Even on my current plane we can technically use asymmetrical reverse if one side is MEL’d.